How Do I Get To the Corolla Horses? 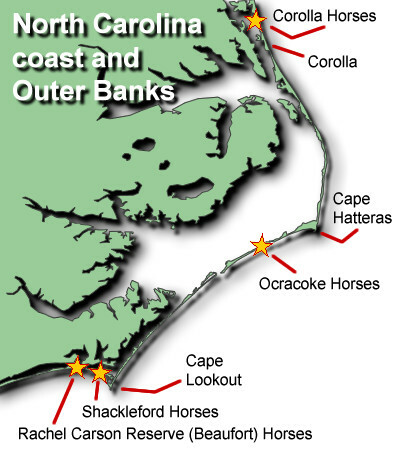 The Corolla horses are located north of Corolla, N.C. on the map at right. -1- If you drive an off-road capable 4-wheel drive vehicle, then you can drive from Corolla onto the beach to reach the horses (no fees or permits required). Note that "all-wheel drive" passenger cars/suv's are NOT recommended. For more details about driving on the beach for the Corolla wild horses, read this article on CarolinaOuterBanks.com. -2- If you don't drive an off-road capable vehicle, then make a reservation with one of the guided tour companies, such as the highly rated Wild Horse Adventure Tours, and they will get you there and find the horses for you. For information on the choices of current tour companies, do a web search for these terms: "wild horse corolla nc tours". Then call or email them according to their web site instructions for cost, availability and reservations. 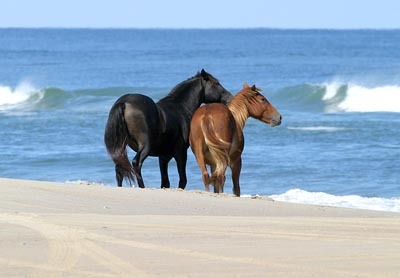 -3- You can rent a beach house/cottage located within the wild horse protected area and have several days to see them. Do a web search for beach rentals with these terms: "beach house rental Carova NC North Swan Beach". How Do I Get To the Shackleford and Beaufort (Rachel Carson Reserve) Horses? The Beaufort and Shackleford horses are located near Beaufort, N.C. on the map above. -1- For the casual tourist family, just go to the downtown Beaufort waterfront and book a ride with one of the excursion boat vendors along the waterfront. These run frequently during the day and advance reservations are not required. Motels will have information on these services. -2- The casual kayaker can easily paddle the two hundred yards from the Beaufort waterfront to see the horses on Town Marsh/Carrot Island/Horse Island (Rachel Carson Reserve). To paddle into the tidal marsh at Rachel Carson Reserve, the casual paddler can leave also from Curtis Perry Park (pdf) at the eastern end of Lennoxville Road (Beaufort water access info). 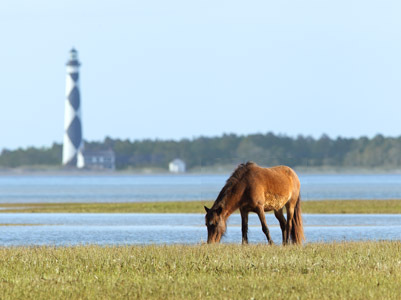 -3- To see the horses on the eastern end of Shackleford Banks next to Cape Lookout Lighthouse, the passenger ferry services on the Beaufort waterfront can take you. They run multiple times during the day and no reservations are required. To visit the eastern end of Shackleford by kayak, a sea kayak is recommended, leaving from the easternmost tip of Harkers Island at the National Park Headquarters. For the western end of Shackleford, take a sea kayak from the Beaufort waterfront. -4- For the more serious and adventuresome tourist or photographer, the highly rated and highly recommended Seavisions Charters can provide you with a custom private guided tour of both Shackleford Banks and the Rachel Carson Reserve horses. Reservations are required. -5- If you have your own motorized boat suitable for shallow waters, you can reach the horses on your own from the Beaufort or Morehead City waterfront.